On Facebook, blog reader Sophia mentioned that she doesn’t like pesto, so she might try the recipe with Alfredo sauce instead (great idea!). It made me think of all the different sauces you could use with this dish… alla checca, vodka sauce, or arrabiata for a spicier flavor. Really, you can use any thick sauce that goes well with salmon. And if you buy a jar of sauce instead of making it fresh, the recipe is even easier! If you have a chance to try it out, either with the creamy pesto or another sauce, please report back and let me know what you think! For background on the Shavuot holiday, check out my blog Shavuot, Ruth, and Cheesecake. Bete’avon! Seared salmon over freshly baked puff pastry, topped with creamy pesto sauce, tomatoes, basil, and cheese. Kosher, Shavuot. 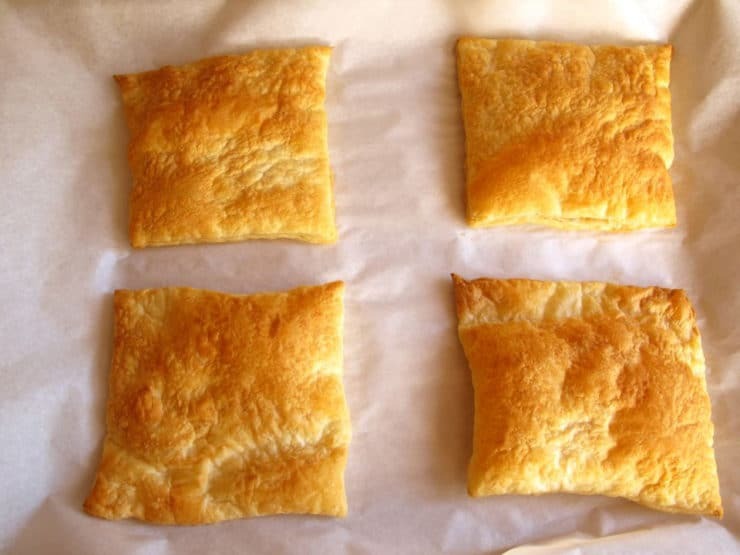 Thaw your sheet of puff pastry dough (it usually takes about 40 minutes). You can also thaw it overnight in the fridge. Preheat oven to 400 degrees F. Line a baking sheet with parchment paper or lightly grease with cooking spray. Whisk together egg with 1 tsp cold water to make an egg wash. 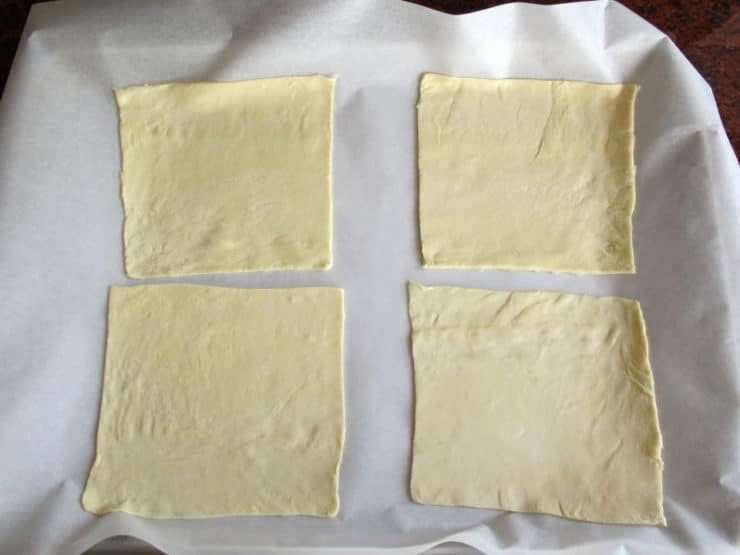 Roll out your puff pastry sheet to smooth ridges and make it slightly thinner. Cut out four squares roughly 5x5 inches in size. Place squares on baking sheet. Brush the squares lightly with egg wash. Place in the preheated oven to bake for 10-15 minutes until golden brown. While puff pastry is baking, fit your food processor with the blade attachment. Place fresh basil leaves inside along with ¼ cup of grated cheese, garlic clove, fresh lemon juice, and milk. 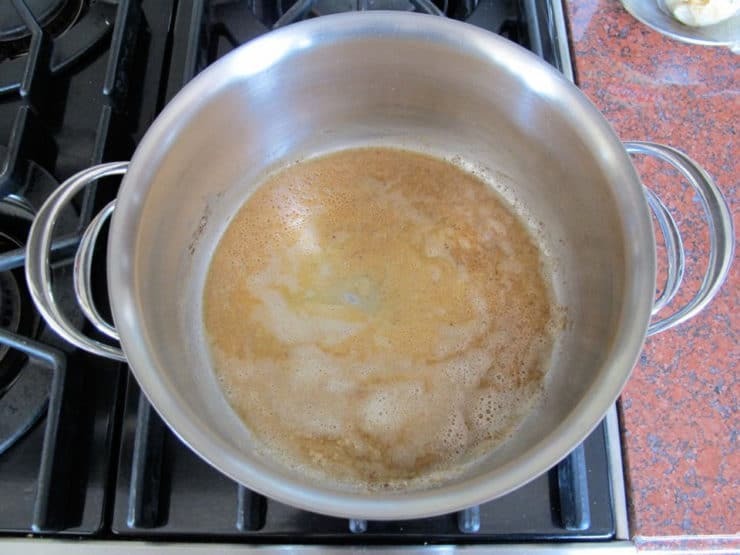 Process until mixture is creamy, scraping the sides once to make sure all ingredients are processed. Reserve ¼ cup of grated cheese for garnish. Place a small saucepan on the stovetop. Melt butter in the pan on medium high heat. 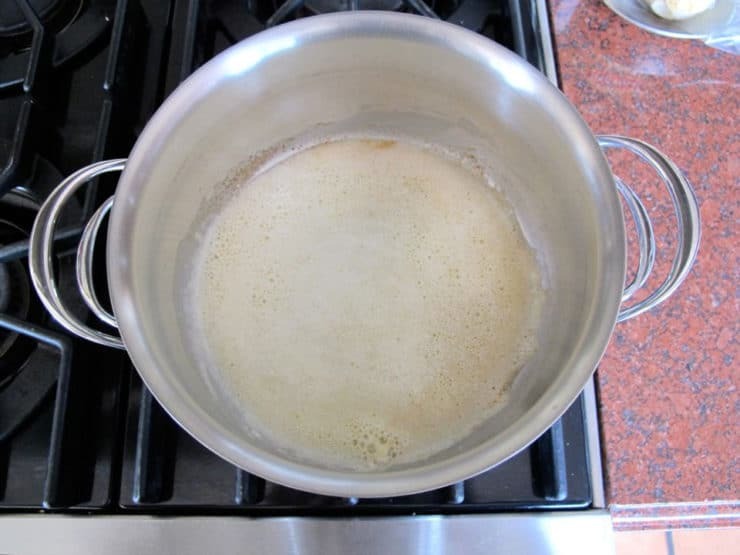 Add flour to the melted butter and whisk to dissolve. Continue whisking until the flour mixture turns a sandy-brown color. 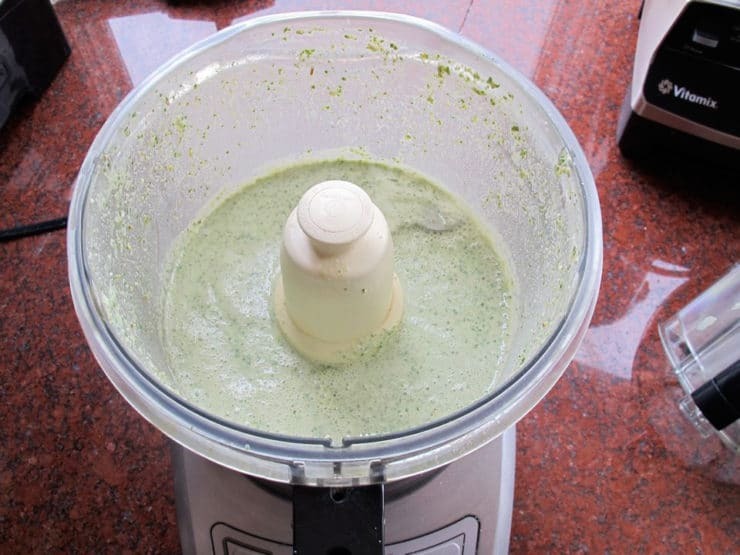 Slowly add basil mixture from food processor, whisking constantly to blend. Bring to a simmer for about 2 minutes to melt the cheese and thicken the sauce. Reduce heat to low, season with salt and pepper to taste. 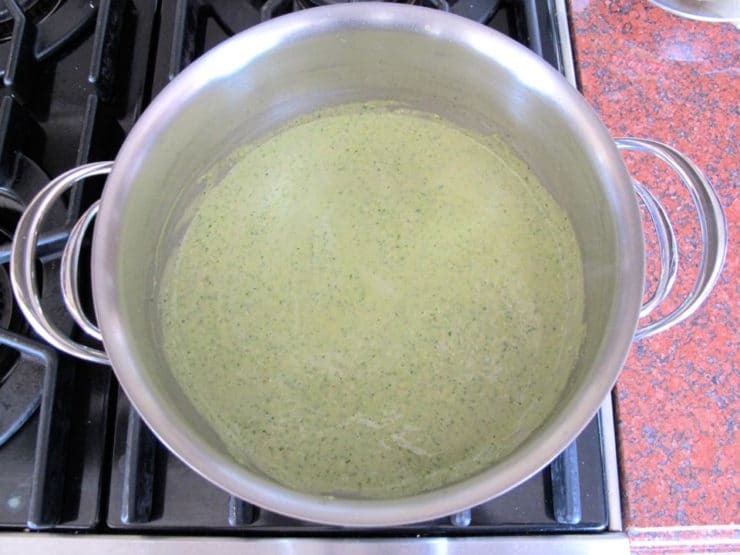 Keep sauce warm until ready to serve, whisking periodically to break up any skin that develops on the surface. When puff pastry is finished baking, remove from oven and set baking sheet on the counter to rest. Turn heat up to 450 degrees F.
In skillet, heat olive oil over medium high heat till hot (not brown or smoking). 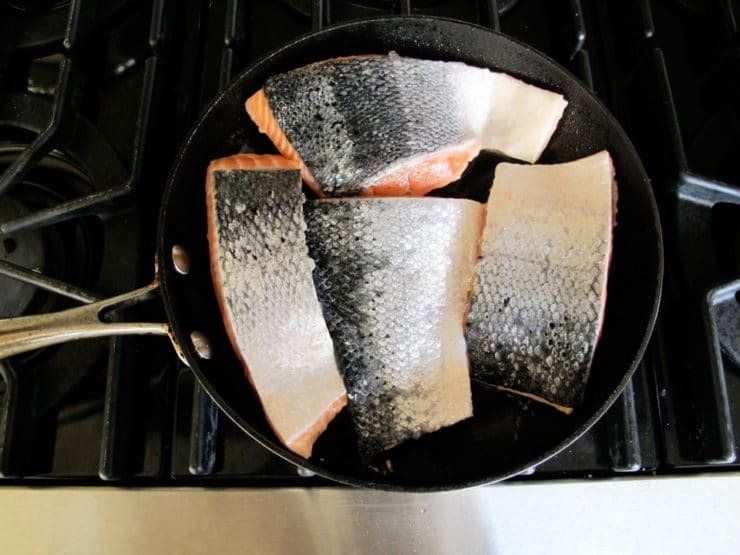 Add the fillets to the skillet—if your fillets are skin-on, place the fillets skin side up, meat side down. Sear them on one side for 2-3 minutes until you see a brown crust forming on the meat. 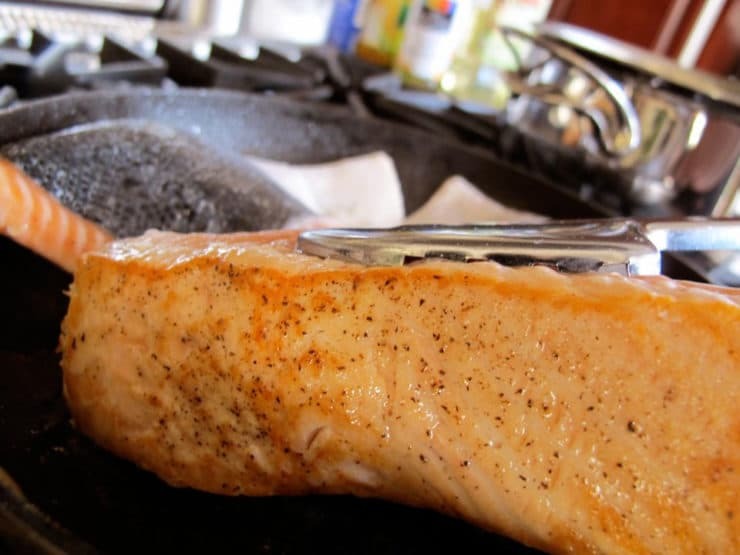 Without flipping the salmon, transfer the skillet to the oven and let it cook for 7-9 more minutes to desired doneness. Remove salmon from the oven. Use an oven mitt, that skillet handle will be HOT! If you cooked your fillets skin-on, peel off the cooked skins and discard before proceeding. Assemble your salmon on serving plates. For each serving, place a piece of puff pastry on the plate. Ladle 3-4 tbsp of sauce onto the top of the puff pastry. Place seared salmon fillet on top of the sauce. Sprinkle the salmon with about ½ tbsp of grated cheese, or more to taste. Top with two fresh tomato slices and a sprig of fresh basil. Serve. 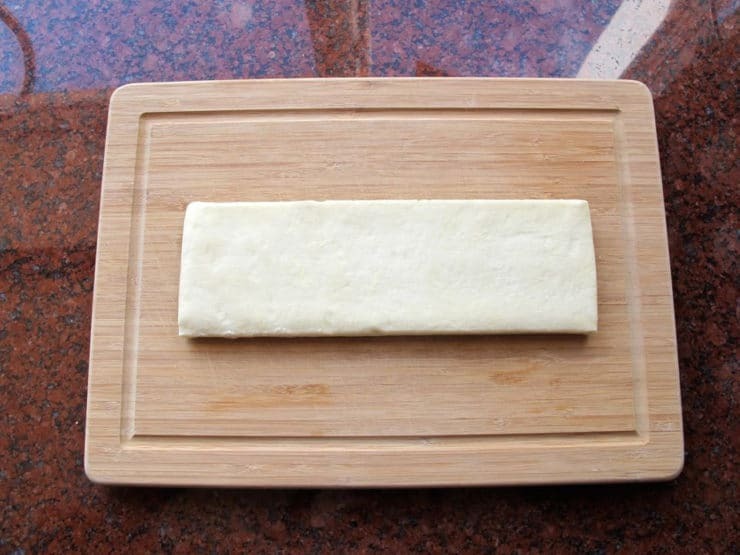 Hi Tory…….try this by wrapping the salmon in the raw pastry dough and then baking. Its faster, and looks amazing, especially when done with a whole side of salmon. Top with sauce just before serving and cutting slices….PS love your new blog title! This looks AMAZING! 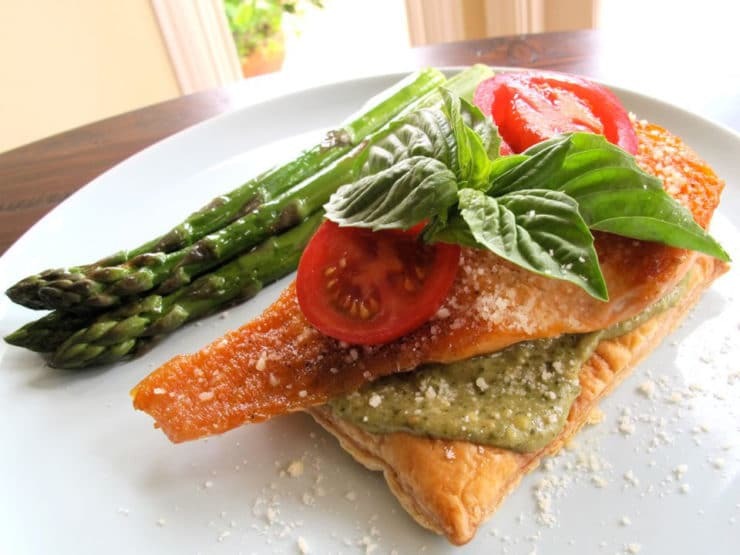 Anything that involves puff pastry, pesto and omega 3’s is a winner in my book! This salmon looks wonderful and is something I know my whole family would enjoy. The kids would love an alfredo or the pesto and hubby and I would probably go for the arrabiata or vodka sauce. 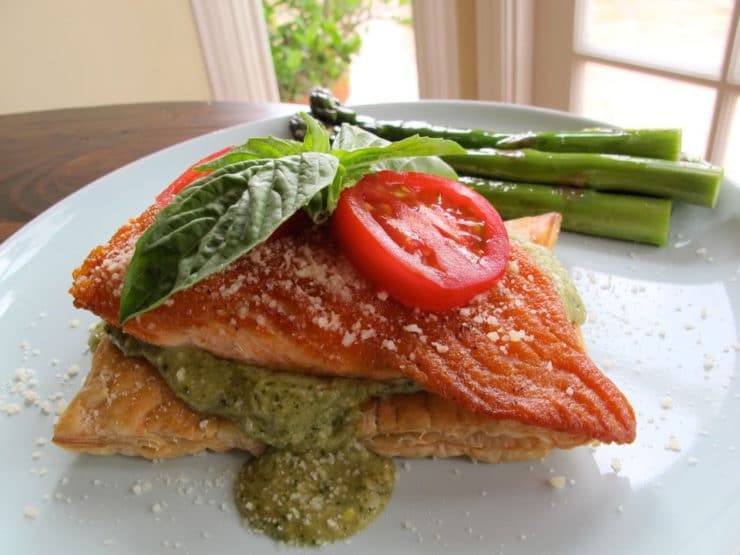 Either way – we all love salmon and served over a pastry – fabulous! What a wonderful dinner and presentation! I would order this out to dinner! Enjoyed your presentation very much. Can hardly wait to try it soon. I also like Sheldons comment. Thanks for the beautiful recipe et al. Thank you for the story of Ruth. I too love her story and think it is very very special. I read the Book of Ruth today. And of course I printed out this incredible recipe. I can’t wait to make it! I need a notebook now for all the great recipes I have printed from your blog. Try making the salmon inside the puffed pastry with a layer of spinach and herbs – a sort of salmon wellington. Thanks for the suggestion Sheldon! I have tried the salmon “en croute” before, but never with spinach. I also like to blend fresh herbs with cream cheese, spread it on the puff pastry, and wrap it up. Maybe I’ll share that one as a dairy dish for Hannukah!